At the traditional January media briefing in Paris yesterday (January 18, 2017), European Space Agency (ESA) General Director Jan Woerner was forthright in laying out the knowns and unknowns about the failed rubidium and hydrogen maser clocks onboard orbiting Galileo satellites, clocks that are absolutely crucial for accurate positioning. "We have some issues with Galileo and I have to mention that in a very transparent way," Woerner told the assembled reporters. "I’m sure that all of you know that the critical point of a satellite navigation system are the clocks onboard." Each Galileo satellite is equipped with four clocks, Woerner explained, "We put on four clocks, two rubidium and two passive hydrogen masers [PHM}, in order to have redundancy. And it was thought that with the new type of hydrogen maser we would have more accuracy. But unfortunately what you have right now is failed rubidium clocks as well as failed hydrogen maser clocks." In all, nine of the 72 orbiting clocks have failed — three rubidium clocks and six hydrogen masers. One additional hydrogen maser clock failed but has been successfully restarted. "I can tell you that none of the satellites in the constellation, so far, are declared inoperative due to these events," Woerner assured. "All of them, in my understanding, are still working." Any given satellite can lose three clocks, he said, leaving it functional but with no reserve clock. So far no satellite has lost more than two. According to ESA, the PHM is the master clock on the Galileo satellite’s payload. Its extremely good performance makes it the most stable of all clocks currently in space, better than one nanosecond per day, according to the agency. Some other features: 18 kilograms of mass, 28 liters of volume, and 20 years expected lifetime. Woerner described the decision to use the Italian-produced hydrogen maser clock specifically as part of a larger European “political” strategy. "This discussion of Galileo as a whole was a strategic decision," he said. "We wanted to have an autonomous European solution for satellite navigation and, so, to have these systems based on European technology was a clear political decision." We remind readers that ESA remains fundamentally the technical wing of the ESA-EC-GSA triad that makes Galileo fly. The EC (European Commission) and GSA (European GNSS Agency) are European Union (EU) authorities, thus essentially political in nature; so, Woerner’s characterization of the technical decision to use hydrogen maser clocks as a political decision could be interpreted as an attempt to deflect responsibility onto the EU, or indeed onto his agency’s own Ministerial Council. We do not subscribe to that interpretation, as Woerner himself went on to vigorously defend the “political” decision. "We have a specific, defined, strategically relevant area where we want to have European autonomy,” said. “And I think it’s correct to have this for several reasons. One reason is if you want to be competitive in the global market, you should not rely for too many aspects on the technologies of others. If you do that, then you are not really autonomous and your competitiveness is decreasing. The ministers decided that satellite navigation and also launchers should be an autonomous capability of Europe, and I think this is a smart decision." Woerner said the Galileo program is of course interacting with others. "It is just that some autonomy is important," he said. "You can say already today that the existence and the decision in favor of Galileo has made a more sustainable GPS, because the Americans are no longer looking to it to switch it off and switch it on or whatever. So, a strategically defined Galileo is also of a high value for Europe. Politics aside, Woerner suggested, even on a pure technical level, it was not a mistake to use a new and “unproven” (for some) clock technology: "The idea was that with the hydrogen masers we would have better performance." And, he insisted, "If you only take proven technology, then you have no future development, and we are looking for the future; so therefore we are trying, and to take risks should be something we are really not afraid about." Woerner described some people as, "ready for risk as long as success is guaranteed. This is not the way I think," he said. "I think we also have to take risk in order to learn, in order to be competitive in the future." Woerner said that even if a given Galileo satellite were to fail entirely, the full final constellation of 32 includes redundant satellites. "We’re not there right now," he said, "but it is a sensitive issue." The key now is to find out what’s happening to the Galileo clocks. In the past two years, there have been five PHM clock failures on the IOV satellites and one PHM failure on the FOC satellites, according to ESA. These failures are better understood, linked to two apparent causes. One is a low margin on a particular parameter that leads, on some units, to a failure. The second is related to the fact that when some healthy PHM clocks are turned off for long periods, they do not restart because of a change in clock characteristics in orbit. To date, two PHM clocks have failed owing to the first mechanism, and four to the second, ESA said. For the remaining 33 RAFS clocks in orbit, the risk of failure is believed to be lower owing to different testing procedures on the ground before launch. 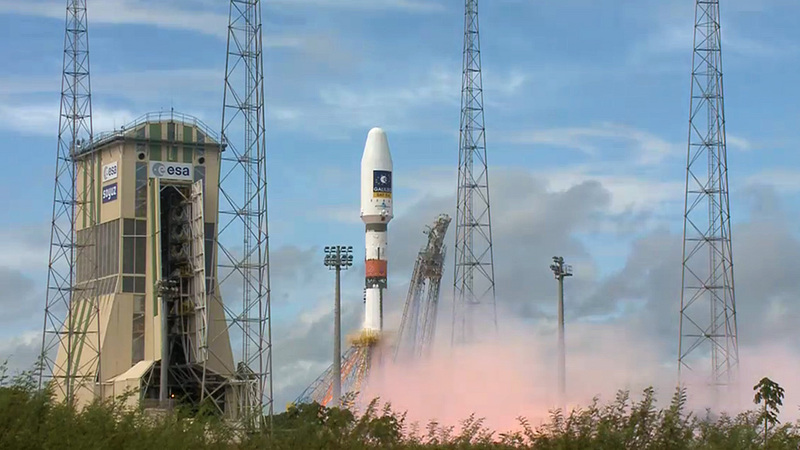 In addition, ESA has put new operational measures in place to further mitigate the risk. All these measures have no effect on Galileo’s overall performance, the agency said. While investigations by ESA and its industrial partners are continuing, ESA said a consensus has emerged that some refurbishment is required on the remaining RAFS clocks still to be launched on the eight Galileo satellites currently being constructed or tested and awaiting launch. ESA said that operational procedures are being studied to significantly reduce the risk of future failure for the 30 PHM clocks working in orbit. These measures are being validated, ahead of their planned introduction in a few weeks. Overall, three out of four IOV satellites have experienced clock anomalies, and two out of 14 FOC satellites. "We had some failures on the FOC [full operational capability] satellites with the rubidium clocks," Woerner said, "but we have had no failures on the IOV [in-orbit validation] satellites with those same clocks; so, the oldest satellites with the rubidium clocks do not have the failure. "There was some indication that switching on and off has some influence," Woerner said. "So, if this is really an important cause, then we don’t do it any longer. We [will] just switch them on or leave them off until we need them. "We have to look into the situation, to see whether we find some systematic root cause and to change it, or whether we have to just go on and say, OK, there might be some failures,’ and by having the big numbers of clocks and the redundancy we are solving it in that way." Woerner also said ongoing discussions are under way with the producer of the clocks, SpectraTime of Neuchatel, Switzerland, which, by the way, are also being used by the Indian Regional Navigation Satellite System and China’s BeiDou Navigation System. "We are also in contact with India concerning this interaction," said Woerner, "and it looks like the behavior is different on different satellites. It is really very difficult, but we are exchanging information. So, there are several things we are considering at the same time." Woerner then raised the obvious question: "Should we postpone the next launch until we find the root cause or should we launch? And you can give both answers at the same time." The response is indeed not simple, he said, involving risks on both sides. And, we know, these risks will be both technical and political in nature. "We are right now in this discussion about what to do," Woerner said. "And we are doing our utmost, meaning also at ESTEC [European Space Research and Technology Center], looking into the details."